Bhagwan Mahavir (Mollem) National park is a beautiful park located in d in the Western Ghats of South India, in Sanguem Taluk,Goa along the eastern border with Karnataka. The national park is located near the town of Mollem. Earlier park was known as the Mollem Game Park which covered the are about 250 sq. km . 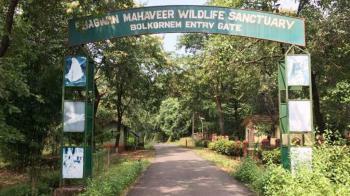 The park was declared as a wildlife sanctuary in the year of 1969, and known as Bhagwan Mahavir Wildlife Sanctuary. In the year of 1978, the core area of the Bhagwan Mahavir Wildlife Sanctuary declared as a National Park. The park is home to a rich and rarefied wildlife species. The vegetation consists of various species of herbs, medicinal plants and shrubs. Cotigao Wildlife Sanctuary (CWS) is situated in Canacona Taluka in Goa district covering an area of approximately 105 sq km and is covered by Semi-evergreen forest, Moist mixed deciduous forest, Riperian fringing forest and Hill valley swamp forest. 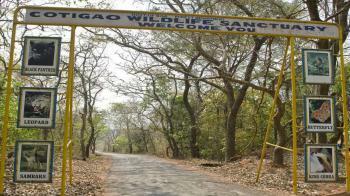 In the year 1958 with an objective to protect different species of wild animals living, the Goa government established the Cotigao Wildlife Sanctuary. A special feature of the sanctuary is a treetop watchtower positioned 25 metres above a watering hole where animals go to drink. At the starting of the sanctuary there is a eco-tourism complex that hoses a nature interpretation centre, library, cottages, canteen, children park and forest ranger office. One of the highest waterfall in India is Dudhsagar Falls, and among the hundred highest waterfall in the world. It lies in the southern part of Goa in mollem. 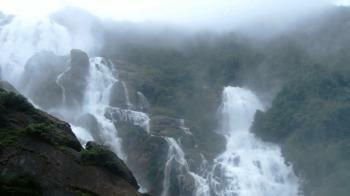 It is forth - tiered waterfall located on the Mandovi river in the border of Karnataka. The height of the waterfall is 1017 feet. Dudhsagar, literally means Sea of Milk and gets its name as it appears like an over flowing sea of milk. The water fall is at its peak flow during the monsoon months from June to September and wanes out towards the summers from March to june. The entrance to the waterfall is from Collem through the forest department gate. Ticket sales are stopped at 3:00 p.m.
Goa the coolest place of India is a state in the South India, bounded by Maharashtra to the north and Karnataka to east and south while the Arabian Sea forms its western coast. Goa is smallest state by area of India and the Forth smallest state by the population. The most important in India is Kingdom of Goa which is civilized , having famous orchards and water. People from all the world make practice of going to Goa to enjoy the shades and groves of trees and to savour the betel. 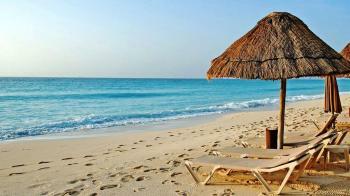 Goa is a multifaceted jewel in the crown of India. It is a frame of mind and body, spirit and soul. Goa is an unfading memory. Goa is one of India's richest states with a GDP per capita two and a half times that of the country.